What do charity gift cards look like? While most charity gift cards are quite similar in the way they work, they can differ greatly in appearance. 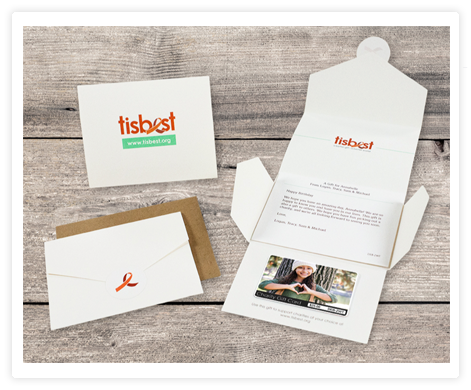 A charity gift card can be made of plastic (just like a conventional gift card), printed on paper, or sent as an email card. Some providers allow you to add a custom image to a card (your family photo, a favorite picture of a pet, or a company logo , for example), while other providers offer only a limited selection of stock images and designs (as few as four design). Cards can be assigned different dollar denominations, which vary greatly from provider to provider. Some providers offer very limited choices in denominations (for example, $5.00, $25.00, $50.00,) whereas other providers allow purchasers to pick virtually any denomination.Below you will find a charity gift card image sample for each of the leading charity gift card providers. Charity on Top, Charity on Top Foundation, Inc. WHICH IS THE BEST CHARITY GIFT CARD FOR ME? WHY DO CHARITY GIFT CARDS MAKE GOOD GIFTS? As charity gift card providers change card offerings, pricing, etc., information on this site may become out of date. If you notice any errors in our data, please bring them to our attention by email to truckeetechnology@gmail.com. CharityGiftCards.com is provided by Truckee Technology LLC to increase awareness of the charity gift card marketplace. Truckee Technology creates and licenses software to manage charity gift card services.